One of the fundamental aspects of successful capitalism is the principal of creative destruction. In a capitalist system, businesses that are hampered with flawed business models, substandard management, unproductive labor or changing markets, among other things, pass away in a sometimes agonizing fit of destruction. New businesses, with a better take on what the market is willing to buy on an ongoing basis and how to produce that profitably, spring up and thrive. It’s the business version of earth to earth, dust to dust and the circle of life. Even though we all know this story and can intellectually recognize that it is a required component to make a capitalistic economic system work, when push comes to shove, or more realistically, padlocks come to factory gates, things get a lot tougher. When long-standing, treasured companies die, such as Maytag, it is traumatic, especially for the local communities. If they are big enough or politically well connected, governments sometimes step in and prop up dying businesses. In the last year we’ve seen multiple examples of this in vehicle manufacturing, insurance, financial services and banking. But even while entire economies are distorted by artificial means, the market keeps changing and creative destruction keeps happening. 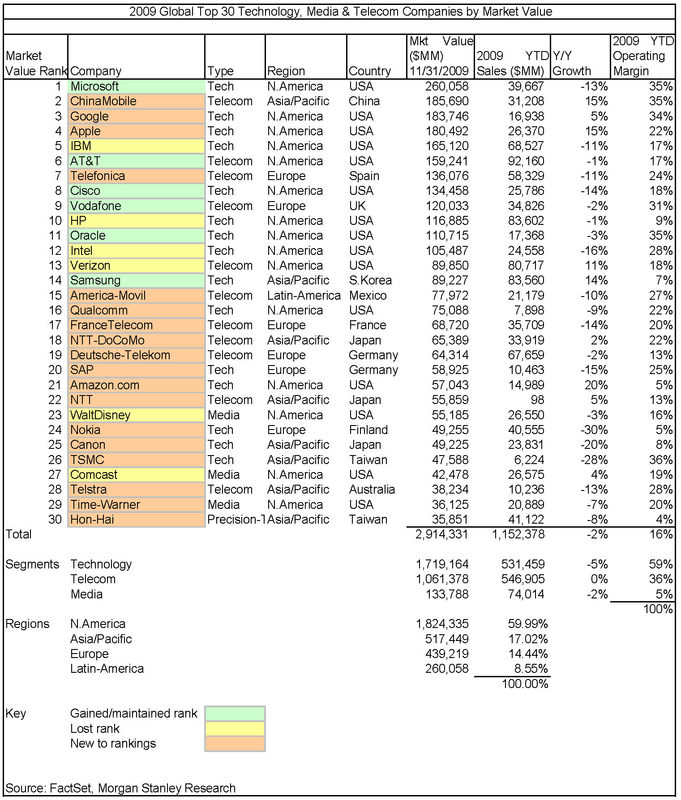 As an example, consider these two ranked lists of the world’s highest market value companies in the technology, media and telecom segments from 1994 and 2009. Note that only 12 companies made both lists. Fully 60 percent of the world’s leading companies in 1994 disappeared from the top 30 list by 2009, and in some cases, disappeared altogether. In addition, entire market segments shifted, with media sliding from 15 to 5 percent of the total market value in 15 years. More significant to those outside that industry, the Asia/Pacific region rose from a trivial 1.63 to a second place 17.02 percent of total market value. Along the way, the Asia/Pacific region eclipsed Europe and is well on its way to overtaking North America. What drives these massive changes? Along with global shifts associated with the rise of China, fundamental chapters of the evolution of technology and its implementation have repeatedly fed into and accelerated the creative destruction cycle. In the first four cycles, there were clear winners, companies that dominated the cycle and realized huge market valuations. For instance, Unisys did very well in the mainframe cycle, DEC in the minicomputer cycle, Compaq in the personal computer cycle and Netscape in the Desktop Internet cycle. As you will notice, none of those companies is currently dominant. 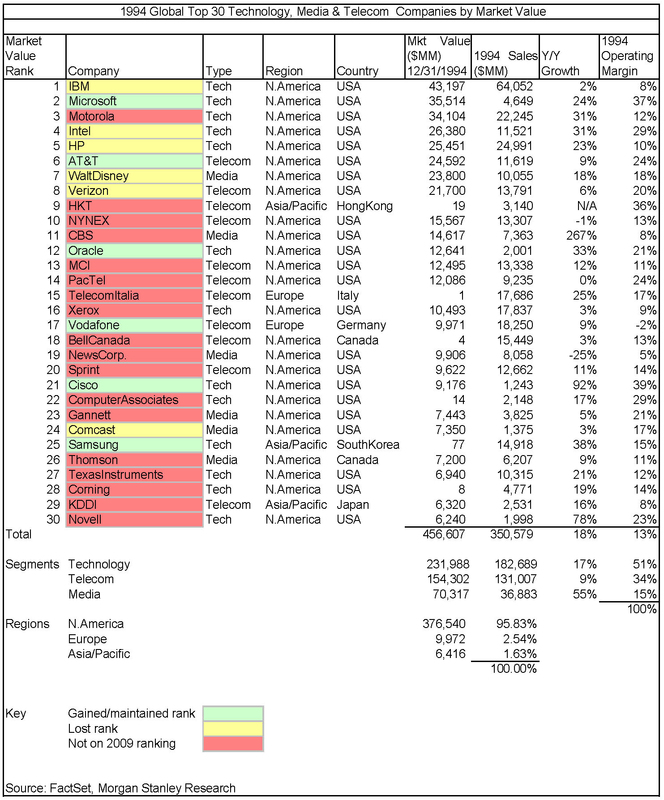 In fact, with the exception of Unisys, none even exists today. Over the last 50 years there is only one company that has done well through all cycles, ranging from near monopoly to significant player: IBM. How did they do it? For one, they reinvented the company on a regular basis, breaking apart entrenched and crusted cultures and business divisions. And secondly, they never stopped investing in research and development. As an example of that commitment to research, IBM ranks number one in U.S. patents awarded in 2009. 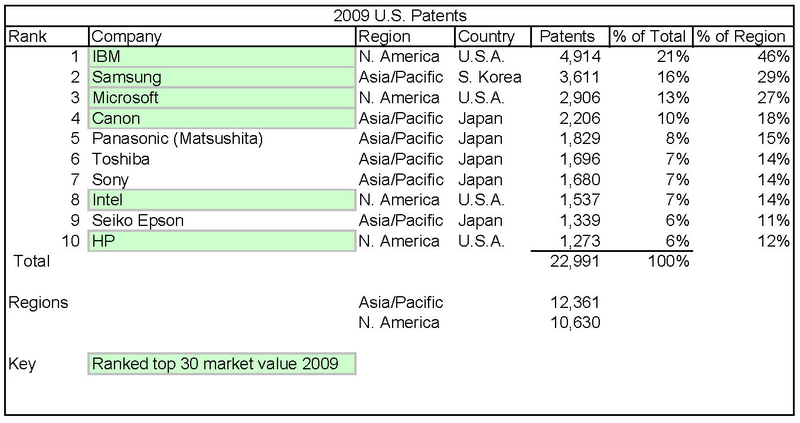 As you’ll notice, six of ten of the top U.S. patent producers were in the 2009 top 30 valued companies ranking. While there is no way to guarantee that any company can and will survive the changes from internal market cycles, such as the rise of the mobile internet, and external influences, such as the rise of China, constant innovation and invention has a proven track record over the last 50 years with IBM. However, history has taught us that innovation and invention, in and of itself, is not enough. Kodak invented digital photography but the inertia of Kodak’s business model based on analog photography prevented them from capitalizing on it. Xerox invented the personal computer, graphical user interfaces, the mouse and the Ethernet, among other things, but Xerox’s business and sales model inertia rooted in leasing high profit margin copiers to large corporations prevented them from capitalizing on any of those world-shaping innovations. Invention is one thing. Changing corporate culture to leverage those inventions is quite another. Companies that demonstrate the courage of vision and the ability to execute constant alteration of their business model to leverage new invention and innovation significantly increase their chances for ongoing success. Creative destruction of companies and market segments will continue as long as capitalism exists. The top 30 market valuation list of technology, media and telecom companies will look different in 2024 than it does today. It will be very interesting to see if IBM, or any of the other survivors from 1994, appear on that list.